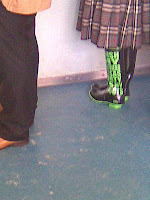 While popping out for some lunch earlier, I came across a young lady wearing a pair of wellies. The wellies had a slogan on them (foolish girl). The slogan read "I wish my boyfriend was as dirty as these boots". I had to take a photo, just to prove I wasn't making it up. Oh the irony? The boots were brand new and sparkling clean. I really wanted to approach her and say "so you want him clean and made of rubber" but thought better of it.